Smith Bearing is a registered trademark of Accurate Bushing Company (ABC). They have over 50 years experience in designing and manufacturing precision needle roller bearings and can handle requirements for standard aerospace and industrial bearings, as well as custom manufactured special bearings, assemblies, and bushings. Their complete range of precision bearings includes cam follower needle roller bearings in inch and metric sizes, stainless steel cam followers for special corrosive applications, cam followers with self-lubricating engineered plastic bushings, SMITH-TRAX with tapered roller bearings and deep-groove ball bearings for high-thrust load applications, aerospace and military approved needle roller bearings for engine and airframe applications, spherical plain bearings, drill jig bushings, and specialty aerospace products and assemblies. Needle roller bearings are manufactured from high quality bearing-grade steel or optional corrosion resistant stainless steel and are the optimal choice for applications that have radial loads. Needle roller bearings are not intended for applications with axial or thrust loads. The heavy stud version (HR Series) is available for extremely high load or high impact applications. The optional crowned outer race allows for angular misalignment between the bearing and track surface. Sealed and pre-greased versions are the most common but are also available in non-sealed for running in oil. Standard sizes range from 1/2″ to 6″. The CR and YR series needle roller bearings are recommended where running loads and shock loads are moderate. Bearing capacity of the CR stud type series is limited by the moderately sized stud. Manufactured from high-alloy bearing quality steel. The HR series have a larger diameter stud and are recommended for applications with high running loads and/or heavy shocks where deflection should be held to a minimum. Rollers and outer races are identical to the standard CR series. Manufactured from high-alloy bearing quality steel. Manufactured from 440 stainless steel, these bearings are intended for applications in harsh environments that require increased corrosion resistance. They are an excellent choice for outdoor use or for applications such as food production facilities that require frequent wash-down and cleaning. The DCR and DYR series are designed with a double row of heavy duty rollers, thicker outer rings and special full-contact seals for improved grease retention. The standard needle rollers are replaced with a non-metallic engineered plastic bushing, which eliminates or reduces the need for bearing lubrication. These bearings are intended for self-lubricated applications. Continuous feed oil lubrication can be used to reduce wear. The MCR and MYR metric needle roller bearings are recommended where running loads and shock loads are moderate. Bearing capacity of the MCR stud type series is limited by the moderately sized stud. Manufactured from high-alloy bearing quality steel. Manufactured from high carbon steel or corrosion resistant stainless steel, the Internal tapered roller or angular contact ball bearing design allows our SMITH-TRAX track rollers to be used on applications that have both high radial and high axial loads. The outer race design is available in a plain straight, flanged, or v-shaped style. The SMITH-TRAX series are available in either a stud or yoke style to support a wide range of applications. Standard sizes range from 1″ to 11-1/2″. Chain roller series (Yoke style) yoke type chain rollers are typically used in fork-lift style equipment or other chain guide applications which may require a double flanged outer ring design. 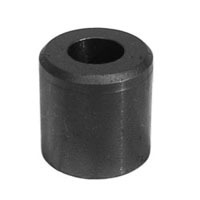 Inner ring races (IRR Series) are hardened and ground and are used as bushings or sleeves. They are complete with radial oil holes and an annular lubrication groove. Spherical plain bearings (GEZ Bearings) are assembled units, which consist of a spherical outside diameter inner ring and spherical inside diameter outer ring. Both inner and outer rings are phosphate treated and coated with molybdenum disulphide. ABC drill jig bushings are manufactured to ANSI standard tolerances and produced from select steels known for their long wear and stability. Smith aircraft bearings have been designed to meet the standards of the aerospace industry and conform to military and other appropriate national standards. Hardened and precision ground smith guide rails are available in multiple lengths and configurations.